Either rice cereal is the ideal starter food for infants or a complete hazard to your baby's health. For over 50 years, people have believed rice cereal is among the best starter foods for infants. The texture, digestibility, and low allergenic content has seemed appealing for immature, potentially sensitive tummies. As of lately though, there has been increasing debate against infant rice cereal. Due to ongoing discussions about arsenic exposure, grains being indigestible for infants, and white rice cereal being the infant-equivalent to a spoonful of sugar to name a few, there are two very opposing sides to infant rice cereal. No wonder you have questions about infant rice cereal! When can we start infant rice cereal? Will adding it to my baby's bottle help him/her sleep better? Will rice cereal help with reflux? Does it matter if I give my baby white or brown rice cereal? Is it true that babies can't digest grains, like rice cereal, until they are at least one or two? Does iron get absorbed from infant rice cereal? Should I be concerned about arsenic and infant rice cereal? The problem is, as gifted as pediatricians are, few are able to stay up to date with all the discussions around these questions about infant rice cereal. They may give you blanket recommendations or basic reference material, such as that from the American Academy of Pediatrics. This all is helpful, to an extent. But when the topic of infant rice cereal continues to come up in a variety of ways among mommy circles, I suspect many of you are left wanting more. More information. More understanding. More applications for what's appropriate, when, and how to offer it to optimize your infant's health. To gain clarity to parents' amounting confusion about this, we must first get rid of the fictitious thoughts about this food. "Just about everyone agrees that is best to wait until 4 months to start solids. Studies have shown that introducing solids before 3-4 months can increase the risk of eczema at age 10, celiac disease, type 1 diabetes, wheezing in childhood, and increased body weight in childhood. However, the debate over starting solids at 4 versus 6 months continues." While the research behind "the ideal window" for introducing solids is unclear, the following consensus appears to be more unanimously agreed upon: Parents should focus less on the calendar and more on developmental cues for readiness. These cues tend to become undeniably obvious at or around 6 months of age. Will adding rice cereal to my baby's bottle help him/her sleep better? Parents of infants are understandably looking for any sort of saving grace when it comes to getting a bit more sleep. Although many individuals may swear that adding rice cereal to an infant's bottle is the golden ticket to a good night's rest, research continues to conclude that's simply not scientific. There is no statistical difference between the sleep habits of those who have or have not had rice cereal added to their bottles. Instead, adding rice cereal to bottles can interfere with an infant's understanding of eating versus drinking, as well as their mechanism for recognizing fullness. Beyond the concern for aspiration, babies who consume rice cereal through bottles are also subject to excessive weight gain. The only reason rice cereal may be added to a bottle is under the supervision of a pediatrician for heath issues like reflux. According to information provided by the Child's Digestive health and Nutrition Foundation and North American Society for Pediatric Gastroenterology, Hepatology, and Nutrition, "thickening the formula will help decrease the amount of regurgitation and lessen irritability. It is recommended to start at one teaspoon of rice cereal per ounce and increase to one tablespoon per ounce as tolerate." If your child has reflux, it is important to work closely with your child's pediatrician prior to using infant rice cereal for your child's reflux. Your family's pediatrician, in conjunction with a registered dietitian nutritionist, can help evaluate your child's complete medical history, ensure their diet is nutritionally adequate, and monitor proper management of your child's reflux. Pediatrician Dr. Greene has made it his mission to eliminate white rice cereal from infant's diets all together. By way of his "WhiteOut campaign," Dr. Greene urges parents to understand the limited nutritional benefits of white rice, especially for infants. As an alternative, most health practitioners agree that brown rice cereal is both a safe and nutritionally acceptable single grain for infants to have as a first food. Followed by barley and oats, the recommendation is to start with low-allergenic, single grains such as these prior to advancing to grains that are potentially more allergenic (like wheat and multi-grain options). "Salivary amylase is responsible for the beginning of carbohydrate breakdown, and is found at very low levels in newborns. But is it low until a year or two of age? No. Between 3-6 months salivary amylase increases in abundance. Another study found it to be 2/3 of adult levels by 3 months of age. So although I hear this as an excuse that babies can’t digest complex carbs, research and physiology easily prove otherwise." Babies can in fact digest a wide variety of grains and should be offered these as part of a healthy, well-balanced diet. At the time when infants are being introduced to solids (4-6 months), their iron stores start to decrease especially among infants who are exclusively breastfed/not given iron-fortified formula. This is why iron-fortified rice cereal is often one of the first foods offered to infants -- to supplement their intake of iron. Although human milk does not contain large amounts of iron, it is very well absorbed. Iron-fortified formula and infant rice cereal on the other hand, are higher in iron but poorly absorbed. According to data from the Center for Disease Control's Recommendations to Prevent and Control Iron Deficiency in the United States, approximately 50% of the iron in mother’s milk is absorbed, compared to only 7% absorption from formula, and 4% absorption from infant cereals. To improve the absorption of iron in rice cereal and other iron-rich foods, it is best to offer sources of both heme and nonheme iron with sources of vitamin C (like citrus fruits, tomatoes, berries, and melons). Since many infants do not initially consume the necessary amount of fortified foods to meet an infant's daily iron requirement (an average of four ounces of dry infant cereal daily), some people may opt to also give their infant additional iron in the form of multivitamin drops. This past April, the Food and Drug Administration (FDA) announced a press release about their efforts to reduce the amount of arsenic in infant rice cereal. This followed after the European Commission set standards for the amount of arsenic allowed in rice itself. The FDA has focused its efforts around infant rice cereal specifically, based on data that shows rice consumption is at its highest (relative to body weight) at eight months of age. While there is concern for the amount of exposure infants may get, most scientists, professionals in the field of food safety, and dietitians alike agree that rice products, especially brown rice based, can have a place as part of a healthy diet. You can read more about this on a recent Vegetables and Virtue post titled, "Infant Rice Cereal: What Every Mom Should Ask." 1. Start infant rice cereal as close to 6 months as possible, or when developmental cues are undeniable. Remember to follow cues over the calendar. 2. Do NOT add infant rice cereal to your baby's bottle to help them sleep better. This is purely anecdotal, as no evidence-based research supports this approach. 3. Rice cereal may help with reflux. Consult your child's pediatrician to discuss safe and effective options. 4. Offer infants brown rice cereal over white, when given the chance. 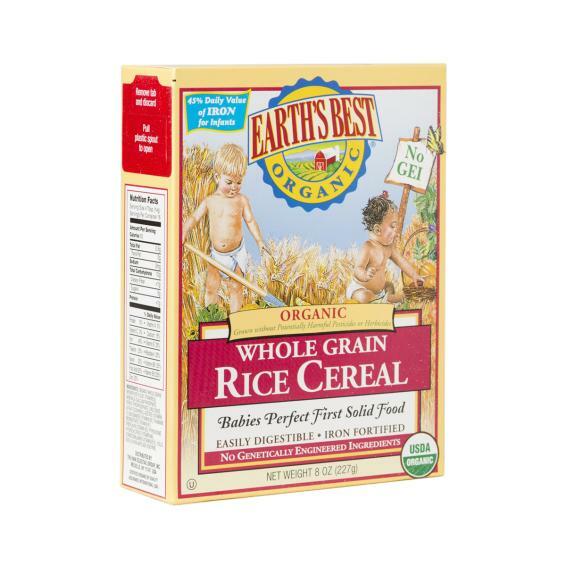 Offering this and other whole grains will introduce your child to more nutritious foods from the very start. 5. Babies can digest grains, like rice cereal. Assuming no other medical conditions are present, there is no need to withhold whole grains from infants or children under the age of two. 6. Iron does get absorbed from infant rice cereal, but at a lesser extent than from breastmilk and other animal-based sources of iron. Consume iron-rich foods alongside vitamin C to improve iron absorption. 7. Offer a variety of whole grains, in order to minimize exposure to arsenic from infant rice cereal. Consider other options like infant cereal made from oats and barely as well. 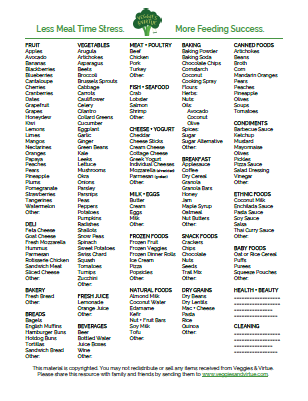 Print this free printable to share with family and friends.